ian and i get together sometimes to catch up on Boardwalk Empires. the show is for the most part good but it does have some boring moments. regardless, when i cook, i normally make waaaaaaay too much food for one sitting. it’s not a bad thing because it is good for leftovers and an extra mouth. in this case, i fed an extra mouth AND had a ton of leftovers. win-win. I also rediscovered my love for my cast iron pot and i’ve been wanting to use it and have been. my pot was the perfect vessel for this dish. bring a pot of salted water to a boil. in a big pot (or sauce pan or cast iron pot!) drizzle oil over medium heat and toss in the carrots, garlic and onion. when the pot of water comes to a boil, toss in the pasta. about three minutes before the pasta is done, toss in the frozen broccoli. drain pasta and broccoli together. when the carrots and onion are soft, add the cubed chicken. when the chicken is cooked, add the butter and wine, simmer for a few minutes. toss in the pasta and broccoli and toss everything together. let the pasta warm up a bit and serve with Parmesan cheese and a glass of wine. thank goodness i like leftovers for lunch because it filled my pot up to the top. this dish was delicious and quite a simple thing to make! i will make this again for sure. i decided to keep it somewhat easy today. 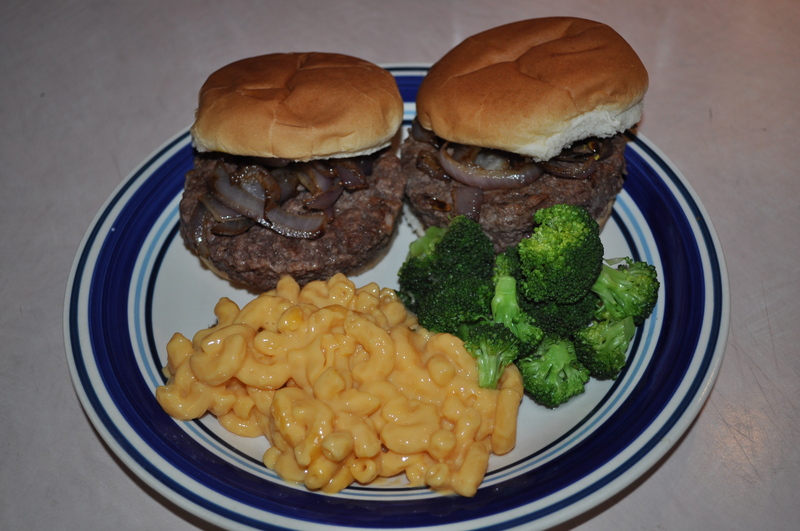 95% lean ground meat was the key to this hamburger. made four patties (only cooked three!) on my stove top grill. i sauteed left over red onion from the bucatini all’amatriciana for a topping along side with ketchup and mustard, of course. 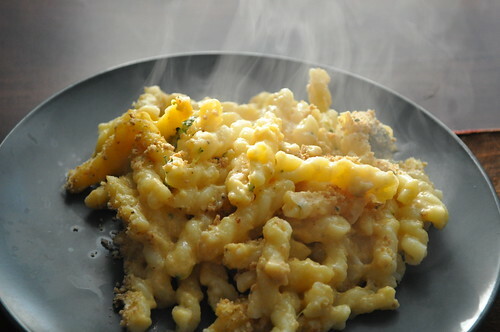 to make things easier, i bought pre-made mac and cheese – ok, ok. while i like to make my own, this is WAY, WAY better than the boxed crap when you don’t want to stand over a stove. try it for yourself. you’ll thank me later. i steamed some broccoli and voilá – summer dinner on a very rainy monday. this made everyone a little bit happier today.